R4 and R5 are the edge routers of AS 45. 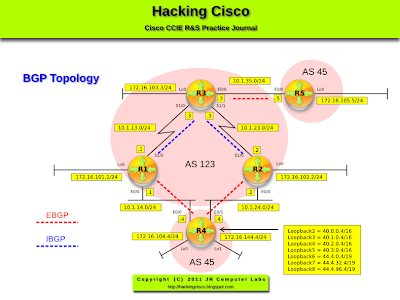 Configure AS 123 in such a way, that the prefixes advertised by R4 are accepted by BGP table on R5 and vice versa. BGP routers use eBGP loop prevention mechanism which prompts them to check if their own AS is anywhere in the path. If so, the prefix is rejected (looped). In corner case scenarios like this, we must disable this mechanism (this may cause loops so care must be taken when configuring this). Pic. 2 - R5's Peering with R3. Pic. 4 - Update Rejected on R5. The option 'allowas-in 1' allows for its own AS (AS 45) to appear once (1) in the AS_PATH attribute. The prefixes are now accepted.